Beautiful 3 Bedroom 2 1/2 home, in Gated Private Community Of Legends Bay. 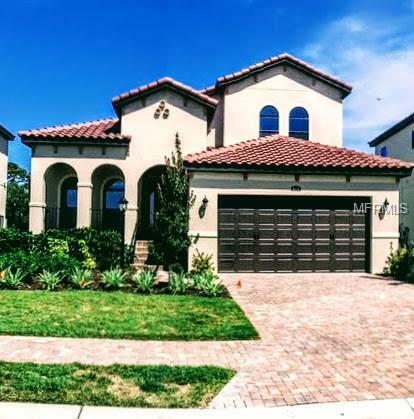 Located just minutes from IMG Academy, Exterior features include barrel tile roof, brick paver large front porch and back lanai areas for relaxing with nice bay breezes. Interior features include decorative tile in common areas, double crown and step ceilings in home office, dining room, family room, and master. Gourmet Kitchen, s/s appliances, huge island, granite counter tops, Ground floor guest suite has en suite bathroom, walk in shower, and walk in closet. Luxurious wide wood stairs. On the 2nd floor you will also find 2 good size bedrooms and 2 full bathrooms. The master bathroom has double vanities, huge walk-in shower, and two walk in closets. The home also has hurricane panels, very high garage ceilings permitting you to add storage shelving. Legends Bay has a community clubhouse, pool, The community is just off El Conquistador Parkway which is a short drive to Bradenton beaches, as well as easy access to 41 leading to downtown Sarasota, airport, restaurants and shopping. Pet Restrictions No Pitbull Or Big Dogs.